This article describes how to compile and run Nagios 4.0.8 (with 2.0.3 plugins) on a Synology DiskStation DS415+ (64 bit), which utilizes an Intel Atom Avoton processor (cat /proc/cpuinfo indicates that the unit is using a 2.40GHz Atom C2538, and utilizes the DSM 5.1-5021 (the latest version as of December 24, 2014) operating system. Nagios is a very useful network monitoring (and even Oracle Database monitoring with plugins) utility that uses email or other communication means to report device or service outages. Not all Synology DiskStation NAS devices use Intel based CPUs – some of the less expensive DiskStations use ARM type processors (see this link to determine the type of CPU installed in a specific DiskStation). It may be possible to produce a working version of Nagios on NAS devices that do not have Intel 32 bit or 64 bit processors (such as the DS212+), but I have not yet fully tested the procedure with many different NAS units. Note that the even though the DS415+ and DS1813+ both use Intel CPUs running a 64 bit DSM version, the installation steps are a bit different (I tried various unsuccessful approaches over the last two months, and finally found a working combination). Warning: A lot of what follows is based on experimentation, with the end goal of having Nagios running on a Synology DiskStation having the ability to ping devices on the network or the Internet, with an email sent to an administrator when a device stops responding to ping requests, and to send a second email when the device resumes responding to ping requests. This functionality represents a small fraction of Nagios’ capabilities through the use of plugins (see my article that describes setting up the Oracle client on a Diskstation to permit Oracle Database monitoring). File paths vary from one Linux distribution to the next, so that adds a bit of challenge to make certain that the files are placed in the required directory. 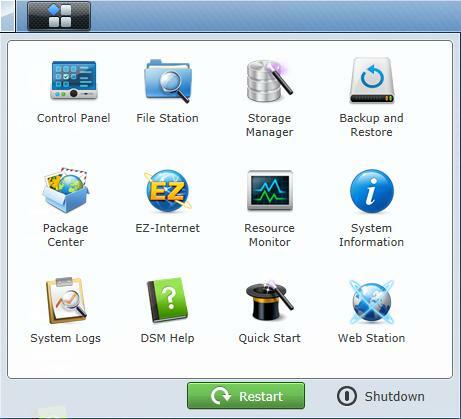 Copying a file to the wrong directory may temporarily disable the DiskStation and require the reinstallation of the Synology DSM operating system. The directions below are not final, and quite likely do not represent the most efficient approaches to accomplish the end goal (note that the steps are more efficient than those for the DS1813+ and DS412+) – but the directions will hopefully be “close enough to correct” to allow the average reader of this blog to ping and send email alerts from a DiskStation. 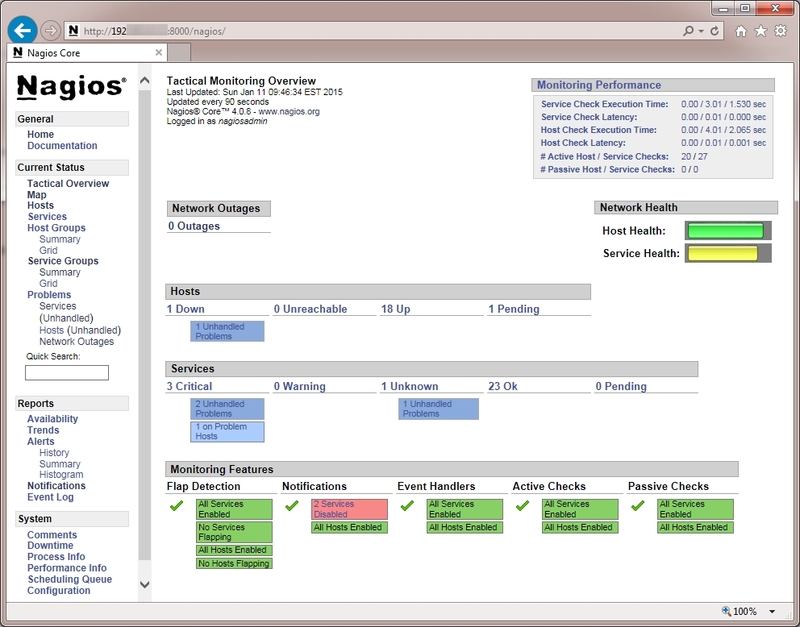 I have relied on the free Nagios network monitoring solution since 2002 to provide an early warning of problems associated with network attached equipment including servers, production floor computers, switches, printers, wireless access points, IP cameras, website accessibility, Internet connection stability, etc. While I rely on Nagios’ alerting system, I am not an expert at configuring the Nagios network monitoring system; the Nagios configuration documentation may be downloaded here. First, make certain that the Telnet Service (or SSH Service if that is preferred) is enabled on the DiskStation. 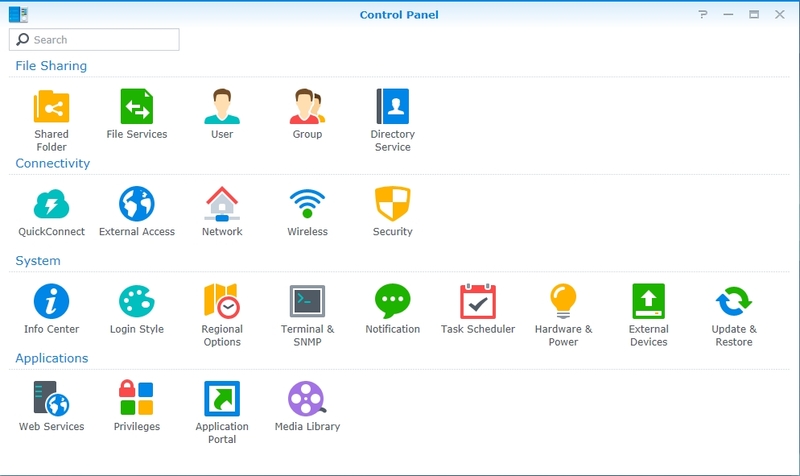 In the DiskStation’s Control Panel, click Terminal & SNMP. Then put a checkmark next to Enable Telnet service, and click the Apply button. Verify that the computer that you intend to use has a Telnet client. 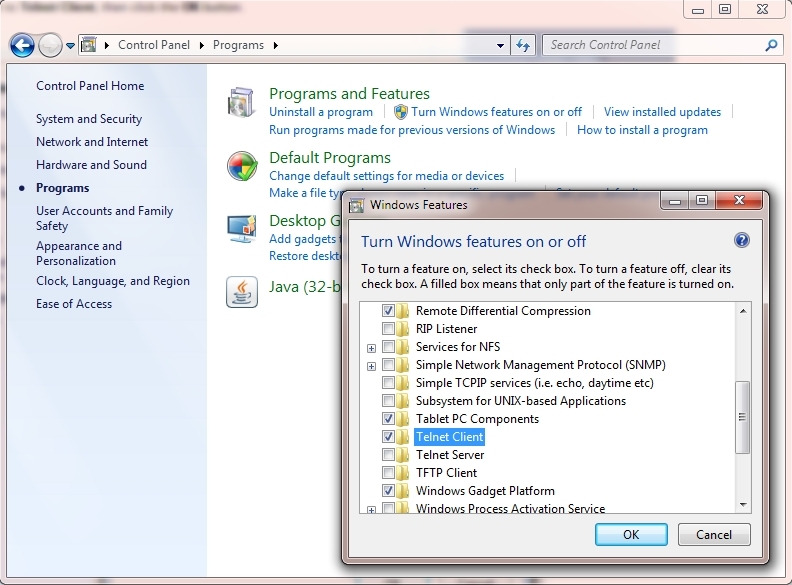 For Windows 7, access the Programs link in the Control Panel, and then click the Turn Windows features on or off link. Make certain that there is a checkmark next to Telnet Client, then click the OK button. 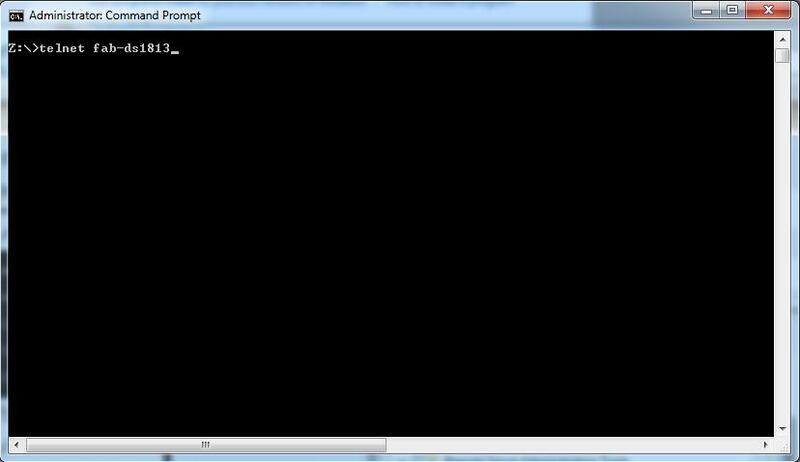 Open a command line (in Windows, Start – Run – type cmd and press the Enter key). On the command line, type telnet followed by either the name of the DiskStation or the IP address of the DiskStation, then press the Enter key. When prompted for a username, type root and press the Enter key. Type the admin user’s password (that is used to access the DSM interface in a web browser) and press the Enter key For example, if the DiskStation has an IP address of 192.168.1.55, the screen would appear similar to the following just before pressing the enter key:. The vi editor is used on the DiskStation to modify files; that vi editor is a bit challenging to use at first sight, so you may need help with a couple of basic commands (see this quick reference for other commands). The commands in vi are case sensitive (i is not the same as I). When a file is opened, press the i key on the keyboard to allow making changes to the file (such as typing commands, or deleting commands). When finished making changes to the file press the Esc key. Once the Esc key is pressed, type ZZ to save the changed file and quit, or :q! to quit without saving the changes. 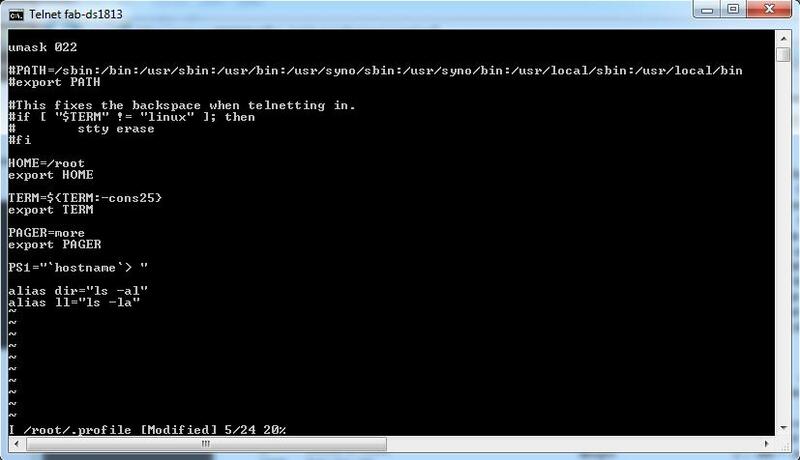 Once the Synology reboots, reconnect a telnet session to the Synology. Update ipkg support and install some ipkg items that will be either directly used by Nagios, or during the installation of Nagios. When installing the optware-devel package, an error may appear stating that there is an incompatibility between wget and wget-ssl – simply ignore that error. An error will also appear when installing Apache – that problem will be fixed in the step that follows. Save the file, and re-execute the ipkg install apache command. 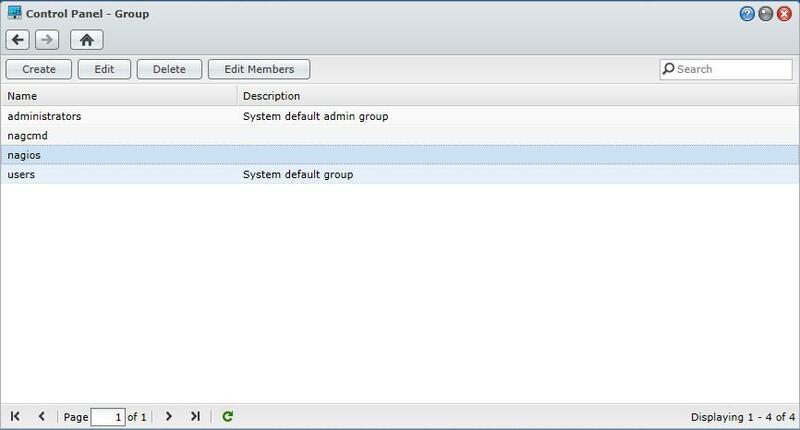 Using the DiskStation’s Control Panel, click Group, and create a nagios group – the group does not require any special DiskStation permissions. 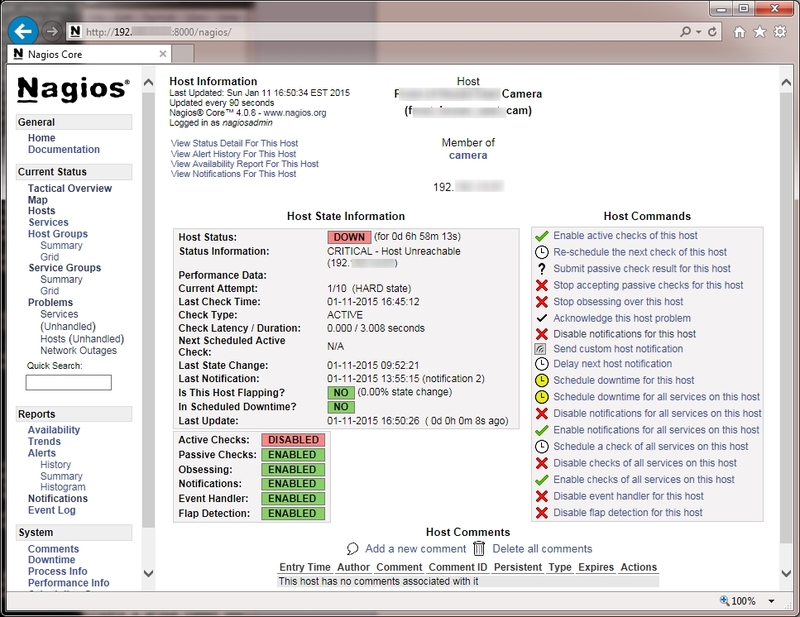 Using the DiskStation’s Control Panel, click User and create a nagios user and add that user to the nagios group. The nagios user does not require any specific DiskStation permissions. We need to make a couple of adjustments in the /opt/etc/objects/commands.cfg file. Save the file and exit vi. (This part still needs some fine tuning to make the web interface work with Nagios.) Edit the Nagios Makefile and change the line beginning with HTTPD_CONF to show HTTPD_CONF=/opt/etc/apache2/conf.d Then save the file. Locate the line in the passwd file for the Nagios user. 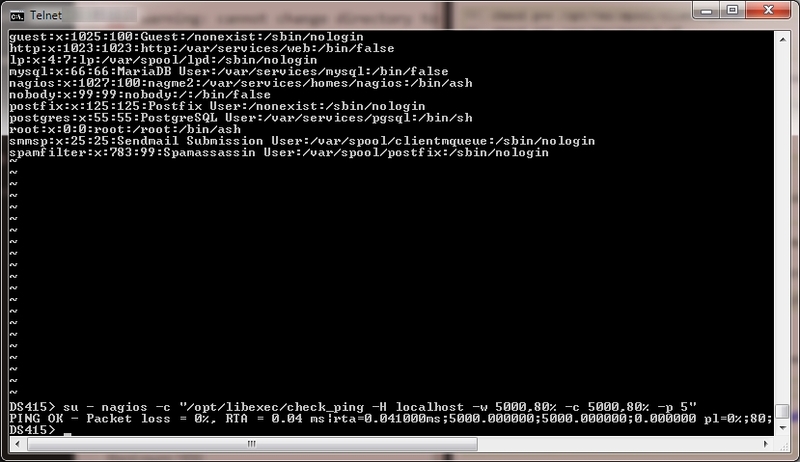 Near the end of the line, /sbin/nologin should appear. Replace that text with /bin/ash then save and exit vi. su - nagios -c "/opt/libexec/check_ping -H MyDeviceHere -w 5000,80% -c 5000,80% -p 5"
su - nagios -c "/opt/sbin/sendmail -vt MyEmailAddressHere@MyDomainHere.com"
WARNING: local host name (DS415) is not qualified; see cf/README: WHO AM I? After setting up the contacts, we should probably tell Nagios which devices to monitor. If there are a lot of devices on your network to be monitored, you might find that using Microsoft Excel rather than vi to create the object definitions makes the task more manageable. See the previous article for the steps to use Microsoft Excel. check_command           check_ping      ; Default command to check if access points are "alive"
check_command           check_ping      ; Default command to check if device are "alive"
Nagios will not know that it should read the additional configuration files until it is told to do so by modifying the /opt/etc/nagios.cfg file. If no errors are found in the configuration, terminate (kill) nagios and then restart Nagios as described above. The value of the Nagios monitoring status web pages becomes apparent fairly quickly by reviewing the above screen capture. The above Tactical Overview shows that there are 18 monitored devices that are up, one monitored device that is down, and another device that is in the process of being checked. The links at the left provide additional information about the monitored devices. Let’s configure the second copy of Apache on the Synology to support the Nagios monitoring status web pages. 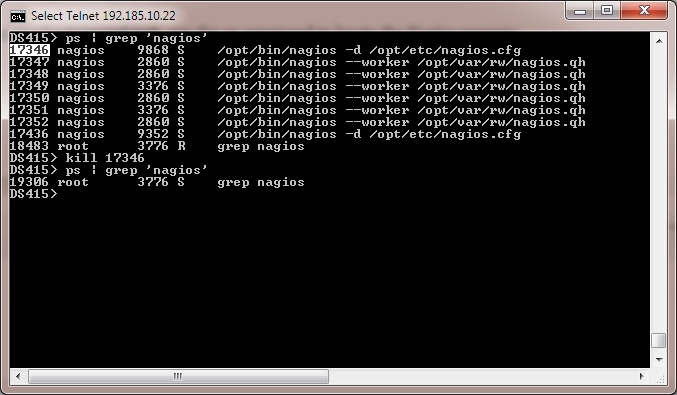 Next, we need to modify the /opt/etc/apache2/conf.d/nagios.conf file that was created during the Nagios installation. 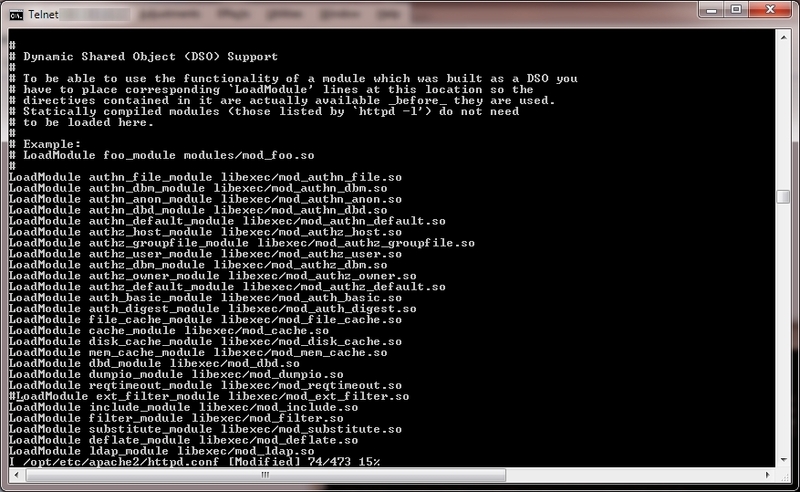 The last of the above errors still remains, the file /opt/sbin/statusmap.cgi does not exist. For now, I will let someone else find a solution for that problem. If you find that a monitored device is down, using the web interface it is possible to disable future checking of the device, as well as alter a number of other notification options. 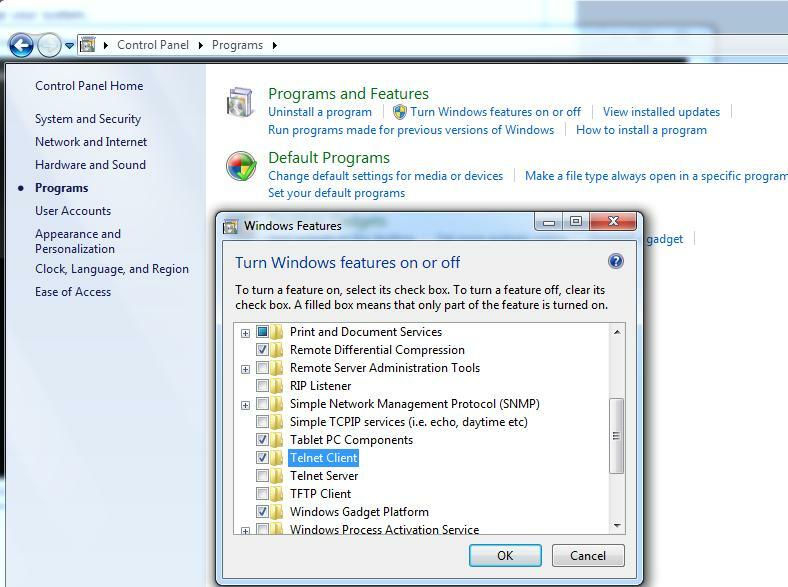 Unfortunately, clicking any of the options under the Host Commands heading will result in a permission error. Refresh the Nagios monitoring status web page – the options under the Host Commands heading should no longer return an error. If you are not familiar with using vi to edit files, you will need to switch vi to edit mode by typing i on the keyboard (note that is a lowercase i) before attempting to make any changes to the file. When you are finished making changes, press the Esc key on the keyboard, then type ZZ to save and exit (note that is uppercase ZZ). arch="x86 cedarview bromolow evansport avoton"
When finished with the edit, the file should appear as below. Save the file and exit vi. Next, we need to create a new spk file that includes the modified INFO file, and copy that file to a shared folder (mysharedfolder in this example) that was previously created on the DS415+ that is accessible from a computer that has access to the DS415+’s DSM interface. Now on the computer that has access to the DS415+’s DSM interface, click Package Center, then click Settings. 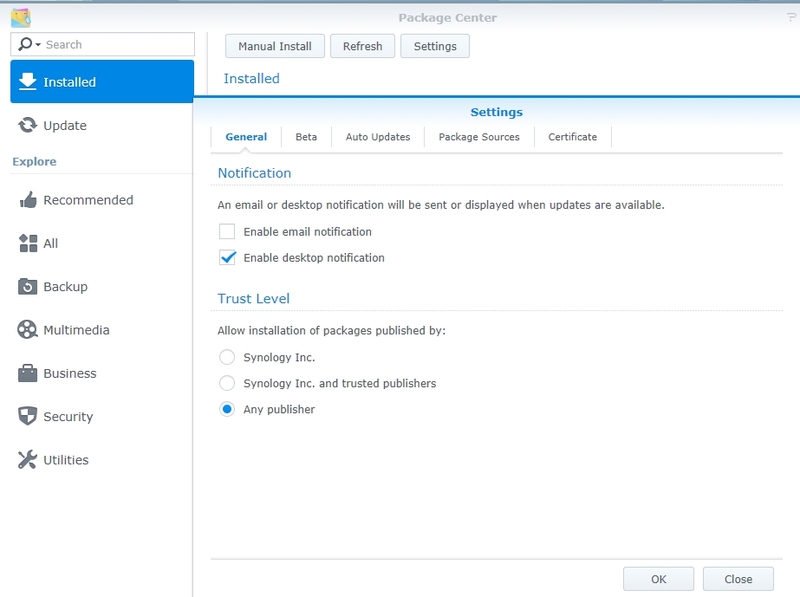 Under the Trust Level heading, change the setting from Synology Inc. to “Any publisher“, then click OK.
Next, install Plex using the Manual Install feature. Click the Manual Install button, then click the Browse button. Switch to the shared folder where the spk file was copied (mysharedfolder in the above example), and select to open the PlexMediaServerMod-0.9.11.7.803-87d0708-x86.spk file. 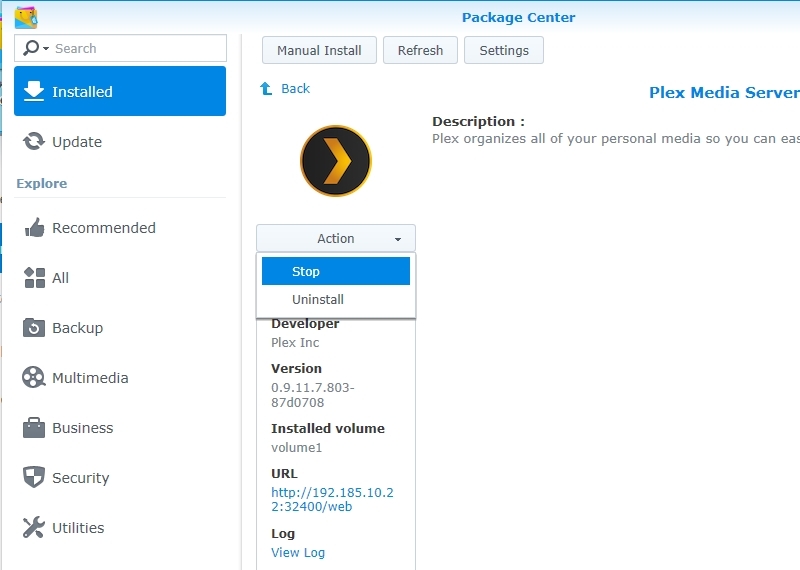 Click the Next button to complete the install of Plex. As far as I could determine, the unsupported channels will only appear when the Plex package is stopped and then started again. 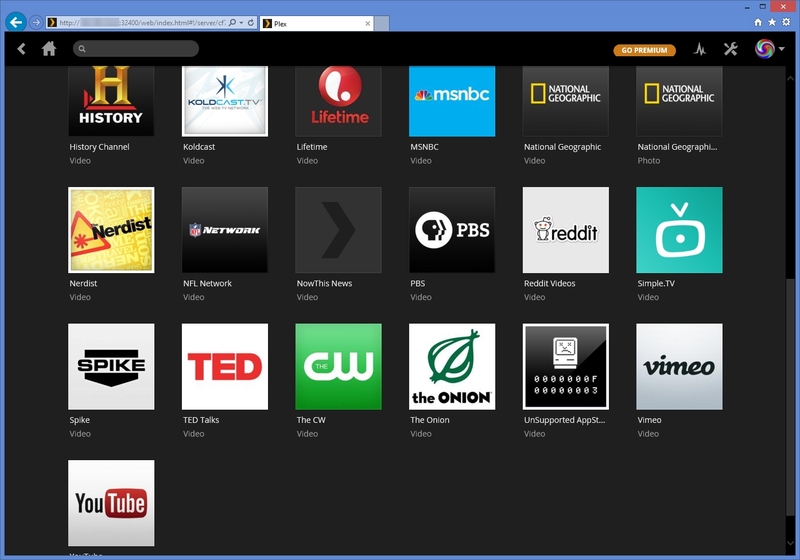 In the Package Center’s Installed list click Plex Media Server. Click the down arrow to the right of Action, then click Stop. Wait 30 seconds, then click the down arrow again and select Run. Clicking the Unsupported AppStore icon should then display a list of categories at the left. 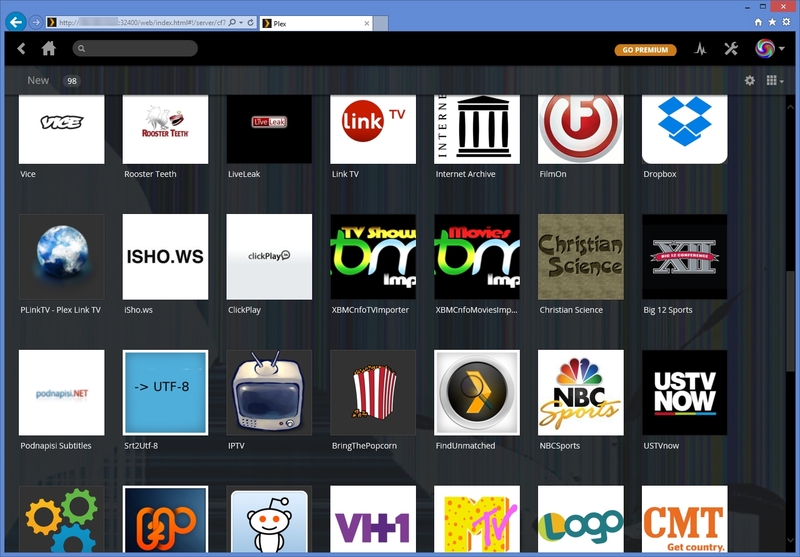 The New category contains quite a few channels, as shown below. To add the channel, click the channel, then click the Install link. I am sure that there is much more to Plex than just offering an alternative to a Roku player or the streaming video options of some Blu-Ray players and network capable TVs (which are also able to retrieve the channels from Plex), but I have not had much time to experiment yet. I understand that Plex is very good at transcoding video streams for different media consumption devices, such as tablets, but I am not sure that I have a use for that functionality yet. A question was asked on the Synology forums whether or not I had any evidence that replacing the pre-installed 2GB of memory with an 8GB Crucial memory card made a measurable difference in the Synology DS415+’s performance. That is a very difficult question to answer – the answer will depend largely on how the DS415+ is used. If the DiskStation is only used to receive 10+ GB files from a single client, the additional memory probably will make no difference in the performance of the DS415+. When the DS415+ was first released there were several discussion threads on the Synology forums indicating that the Synology DS415+ was not powerful enough to handle 1080p video for clients wishing to play back that video on various streaming devices, while the less powerful DS415Play could support 1080P playback for clients because it had additional coprocessors to support video transcoding. So, I thought that I would try a quick test with the DS415+. The DS415+ is running Nagios to monitor several devices, including 15+ high definition security cameras, as well as acting as the FTP target for those security cameras. The DS415+ is also running WordPress, although WordPress has not seen much action lately on the unit. Plex is occasionally used on the DS415+, but had not been used in the last 10 to 12 hours. The DS415+ with 8 GB of memory installed showed the following memory statistics in its Resource Monitor: Reserved: 217.6 MB, Used: 741.9 MB, Buffer: 151.7 MB, Cached: 6.8 GB, Free: 166.5 MB. So, most of the additional 6 GB of memory was used for file caching, which helps speed up the apparent write speed of files, and the read speed of frequently accessed files. I still cannot say for certain if the additional memory helped in this particular stress test. However, for the current cost of the 8GB memory card ($55 USD), the additional memory could prove to be helpful depending on how the DS415+ is used – all that it would take in this case is for a WordPress cache optimizer to consume 400 MB of additional memory to push the DS415+ over 2 GB of total memory consumption. I now have Nagios running on an ARM based Synology DiskStation DS212+. Most of the steps are the same as outlined below, however there are a few additional errors that must be addressed (see below additional steps). All of the ./configure commands should have included –prefix=/opt (rather than –prefix=/usr/local or completely omitting that parameter). That change eliminates the need to copy the Nagios plugins to the correct location. Possibly related, the -i parameter was unnecessary for the snmp and Nagios plugins make and make install commands when the ./configure command included the –prefix=/opt prefix. The wget http://sourceforge.net/projects/dsgpl/files/DSM%204.1%20Tool%20Chains/Intel%20×86%20Linux%203.2.11&#8230; download step for the gcc compiler is apparently unnecessary, at least on the Synology DiskStation DS212+ (see below). This article describes how to compile and run Nagios on a Synology DiskStation DS1813+ (64 bit) or Synology DiskStation DS412+ (32 bit, the 32 bit steps should also apply to the DS1812+) NAS, both of which utilize Intel Atom processors (cat /proc/cpuinfo indicates that the DS412+ is using a 2.13GHz Atom D2700, while the DS1813+ is using a 2.13GHz Atom D2701), and utilize the DSM 4.2 operating system. Not all Synology DiskStation NAS devices use Intel based CPUs – some of the less expensive DiskStations use ARM type processors (see this link to determine the type of CPU installed in a specific DiskStation). It may be possible to produce a working version of Nagios on NAS devices that do not have Intel 32 bit or 64 bit processors, but I have not yet fully tested the procedure. Warning: A lot of what follows is based on experimentation, with the end goal of having Nagios running on a Synology DiskStation having the ability to ping devices on the network or the Internet, with an email sent to an administrator when a device stops responding to ping requests, and to send a second email when the device resumes responding to ping requests. This functionality represents a small fraction of Nagios’ capabilities through the use of plugins. File paths vary from one Linux distribution to the next, so that adds a bit of challenge to make certain that the files are placed in the required directory. 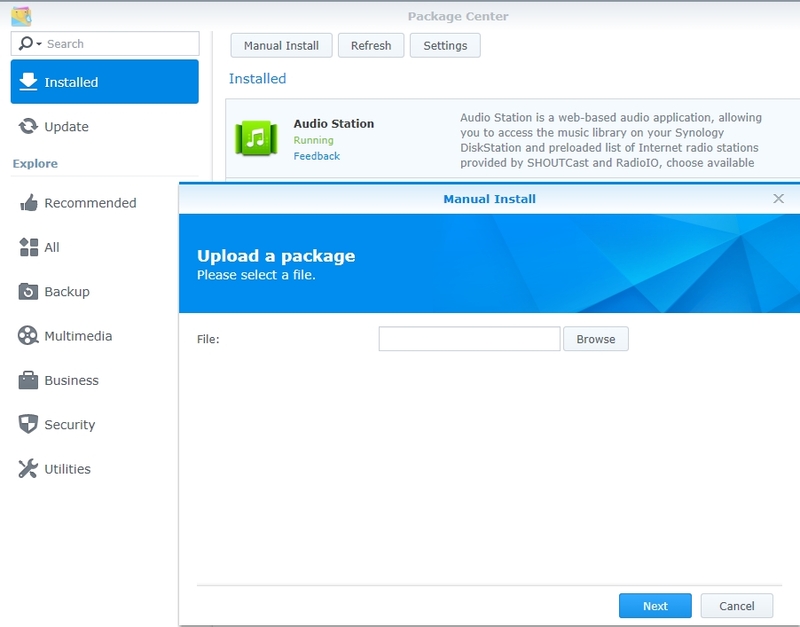 Copying a file to the wrong directory may temporarily disable the DiskStation and require the reinstallation of the Synology DSM operating system. The directions below are not final, and quite likely do not represent the most efficient approaches to accomplish the end goal – but the directions will hopefully be “close enough to correct” to allow the average reader of this blog to ping and send email alerts from a DiskStation. I have relied on the free Nagios network monitoring solution since 2002 to provide an early warning of problems associated with network attached equipment including servers, production floor computers, switches, printers, wireless access points, IP cameras, Internet connection stability, etc. While I rely on Nagios’ alerting system, I am not an expert at configuring the Nagios network monitoring system; the Nagios configuration documentation may be downloaded here. 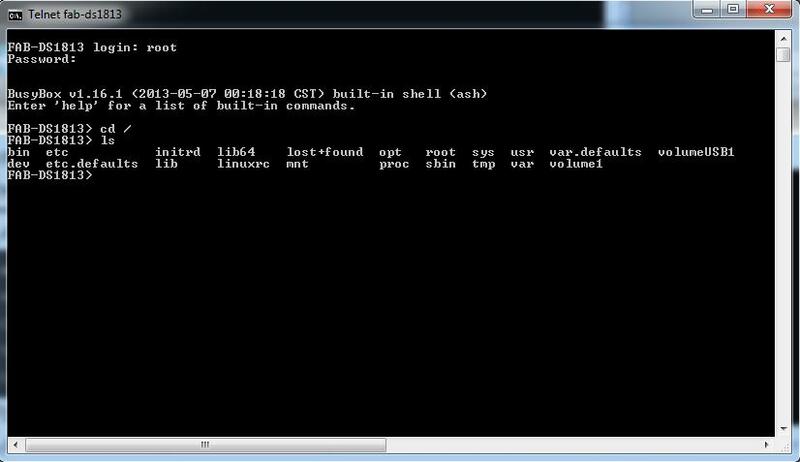 First, make certain that the Telnet Service (or SSH Service if that is preferred) is enabled on the DiskStation. In the DiskStation’s Control Panel, click Terminal. 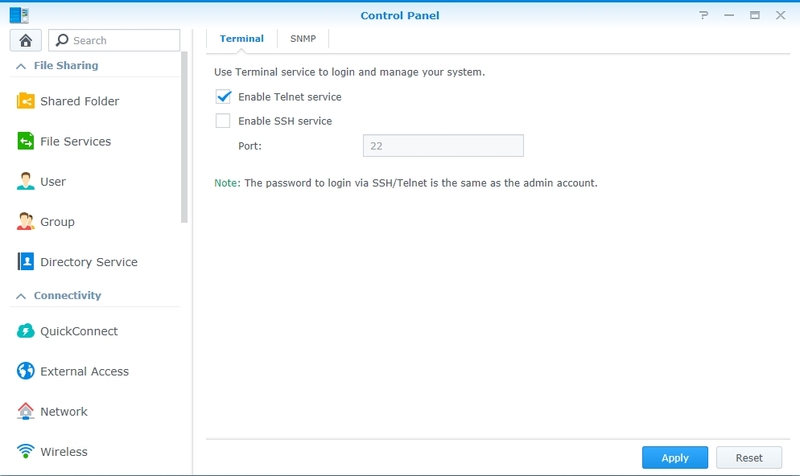 Place a checkmark next to Enable Telnet service (if the item is not already checked), and then click the Apply button. 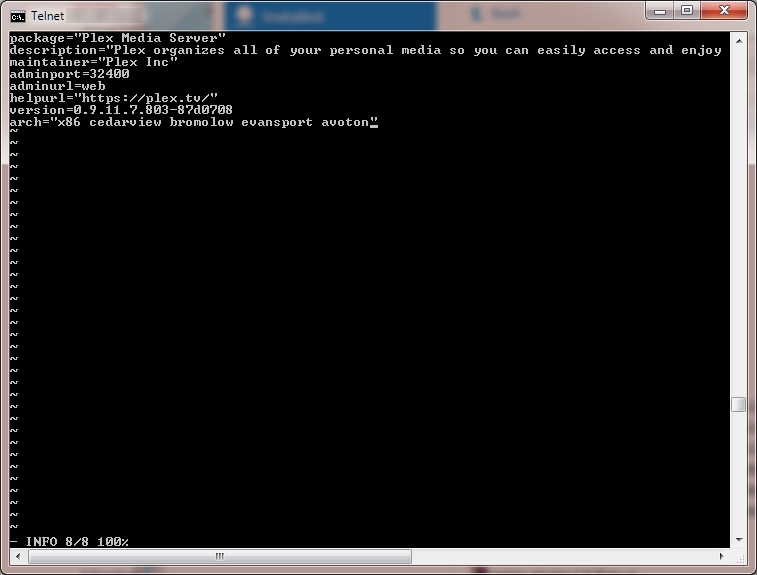 Open a command line (in Windows, Start – Run – type cmd and press the Enter key). On the command line, type telnet followed by either the name of the DiskStation or the IP address of the DiskStation, then press the Enter key. When prompted for a username, type root and press the Enter key. 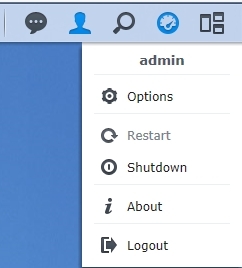 Type the admin user’s password (that is used to access the DSM interface in a web browser) and press the Enter key. Next, reboot the DiskStation by clicking the Restart button in the Synology DSM interface (note: it should be possible to type reboot in the Telnet interface, however the DiskStation locked up the one time I attempted to execute that command). Once the DiskStation reboots, reconnect to the DiskStation using Telnet, connecting as the root user, just as was done earlier. Next, download a couple of packages that will be used by the Nagios network monitoring tool. 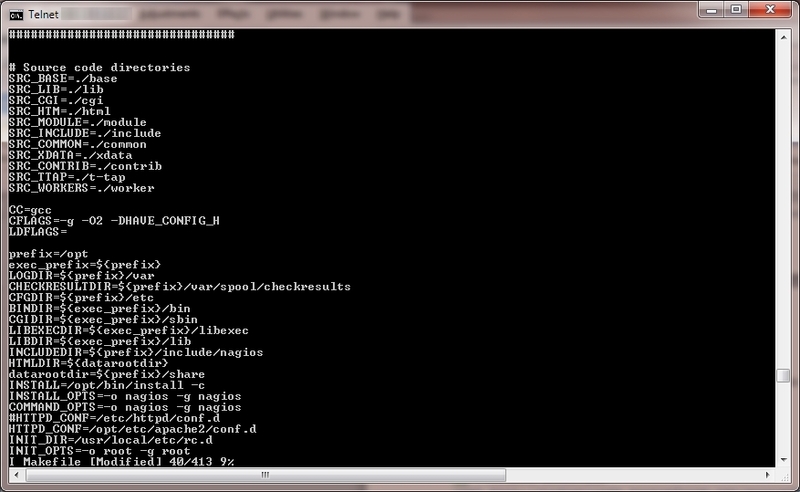 Note that using ipkg to install packages is a lot easier than compiling source code, so have fun with the ipkg utility. When installing the optware-devel package, an error may appear stating that there is an incompatibility between wget and wget-ssl – just ignore that error for now. If an error message is displayed on screen about mod_ext_filter.so, then modify the /opt/etc/apache2/httpd.conf file and add a # in front of the line LoadModule ext_filter_module libexec/mod_ext_filter.so and save the file. Re-execute the ipkg install apache command (note that the up arrow on the keyboard may be pressed to quickly retype one of the previously executed commands). Using the DiskStation’s Control Panel, create a nagios group and a nagcmd group (the nagcmd group probably will not be used for anything specific). 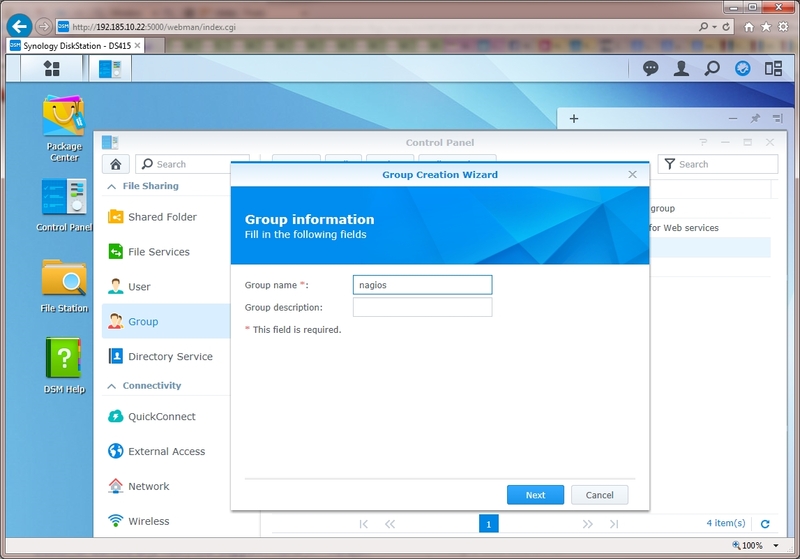 These groups do not require any special DiskStation permissions. 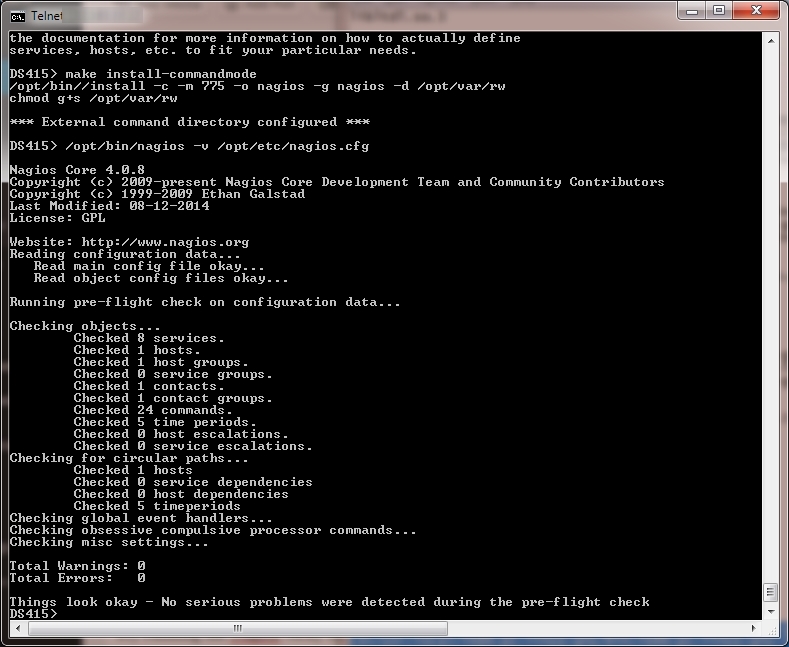 Using the DiskStation’s Control Panel, create a nagios user and add that user to the nagios and nagcmd groups. The nagios user does not require any specific DiskStation permissions. Error: nanosleep() needed for timing operations. After making the above changes, I was able to run the configure and make all commands without receiving an error. A step that may or may not be required is to download a functioning C++ compiler (some of the commands below point to files provided with the C++ compiler) – it appears that there should already be a compiler on the DiskStation at this point (in /opt/bin), so the successful completion of this task of downloading a usable C++ compiler might not be required. The -i parameter may be omitted when running the make and make install commands. ./configure --prefix=/opt --with-openssl=/usr/syno/bin/openssl --with-nagios-user=nagios --with-nagios-group=nagios --with-ping-command="/opt/bin/ping -c %d %s" --psdir=/bin --with-ps-varlist="&procpid,&procppid,&procvsz,&procrss,procprog,&pos" --with-ps-cols=6 --with-ps-format="%d %d %d %d %s %n" --with-ps-command="/bin/ps -w"
GabrielM reported in a comment below that the third command above may fail. Depending on the compile options used, the first two commands or the third command may fail. The first two commands are intended to accomplish the same task as the third command; the first two commands or the last command are expected to fail, but all three commands should not fail. I should have explained this potential area of concern better. After setting up the contacts, we should probably tell Nagios which devices to monitor. If there are a lot of devices on your network to be monitored, you might find that using Microsoft Excel rather than vi to create the object definitions makes the task more manageable. Set up a simple worksheet with four columns. Column A will be used to specify the short host_name for the object to be monitored. Column B will be used to specify the alias (long description for the object). 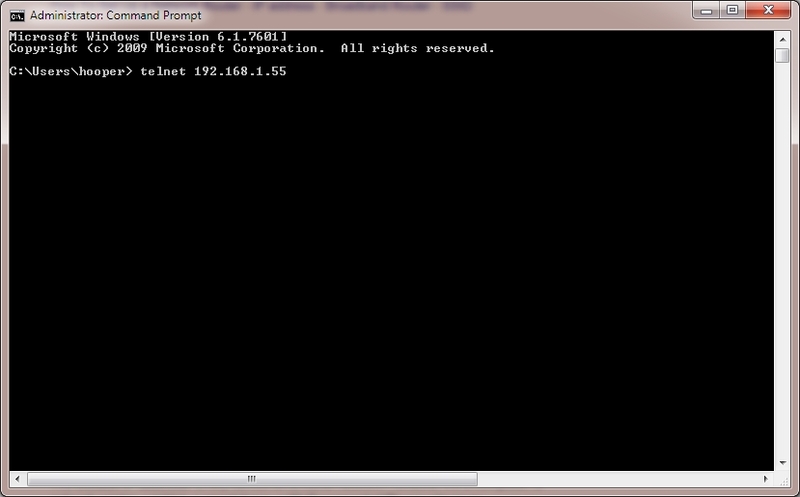 Column C will be used to either specify the IP address for the device or the network name for the device. 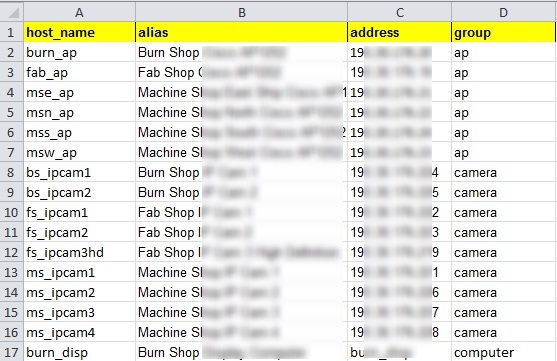 Column D will be used to identify the group to which the object belongs and the file name to which the definition is saved (the Excel macro supports the following groups: ap, camera, computer, external, other, printer, server, switch). The Excel macro is set up to read a tab delimited file, rather than reading the object description directly from the Excel worksheet. Highlight all of the rows in the worksheet except for the top header row, and press Ctrl C (or edit – Copy) to copy the definitions to the Windows clipboard in tab delimited format. Start Notepad (Start – Run – Notepad), and then press Ctrl V (or edit – Paste) to paste the tab delimited object descriptions into Notepad. The Excel macro code expects the text file to be saved as nagioshosts.txt. The files that are created use Unix/Linux standard line feed end of line marker characters, rather than the Windows standard carriage return/line feed combination characters. As such, opening the generated files using Notepad is not advised. Copy the generated files back to the /opt/etc/objects/ path on the DiskStation (copy the files to a Shared Folder on the DiskStation, then use the cp command to copy the files from the share location to /opt/etc/objects/ – the Shared Folders are typically created as a subdirectory in the /volume1/ directory). If no errors are found in the configuration, terminate (kill) nagios and then restart as described above. 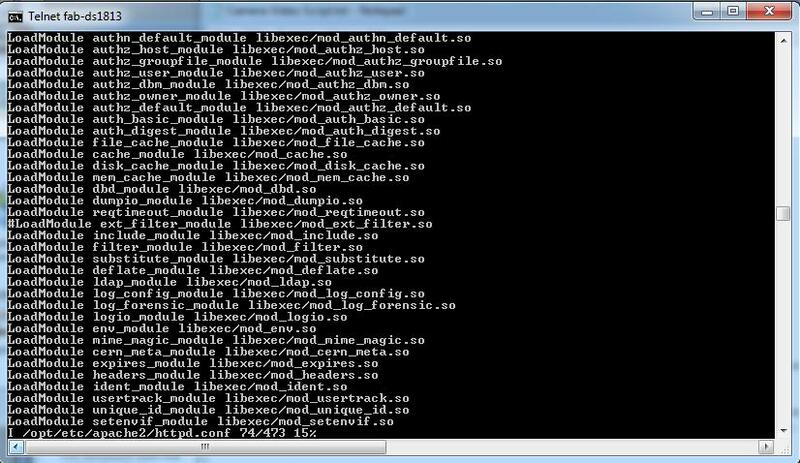 Warning: Could not open object cache file ‘/opt/var/objects.cache’ for writing! There are a lot of seemingly interesting Nagios plugins, including check_oracle (I believe that this plugin requires the Oracle client to be installed – good luck with that install). On one of the DiskStations the check_snmp plugin did not compile, while on the other DiskStation the check_http plugin did not compile. It might be interesting to see what solutions readers are able to develop from the above starting point. The above information is the result of many hours of experimentation as well as a couple minutes reading through sections of the Nagios documentation (it reads like the Oracle Database documentation, so it should be an easy read once I am in the right mood) and hopelessly scanning the ‘net for information about obscure error messages. Have fun, and try not to put the DiskStation out of service due to a mistaken file copy. 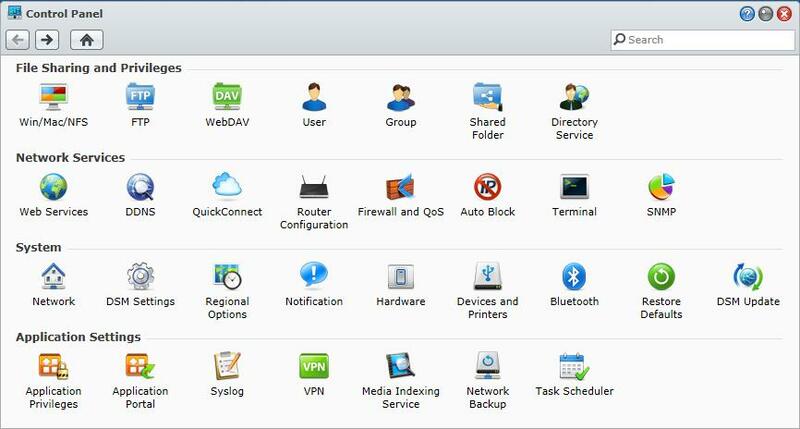 Installing an updated version of the Synology DSM operating system may temporarily disable Nagios. Make backups of all Nagios confirguration files (copying the files with the cp command to a directory in /volume1 is generally safe) before installing different versions of the Synology DSM operating system. In the /etc/passwd file, change all /homes/ entries to /home/ then save and exit vi. Once the above items are copied, try executing the check_ping command as the nagios user (replace MyDeviceHere with either an IP address or the name of a device on your network). If a file is listed when the above command is executed, then Nagios should now be fully repaired.